Diffuse: Specifies the surface color. 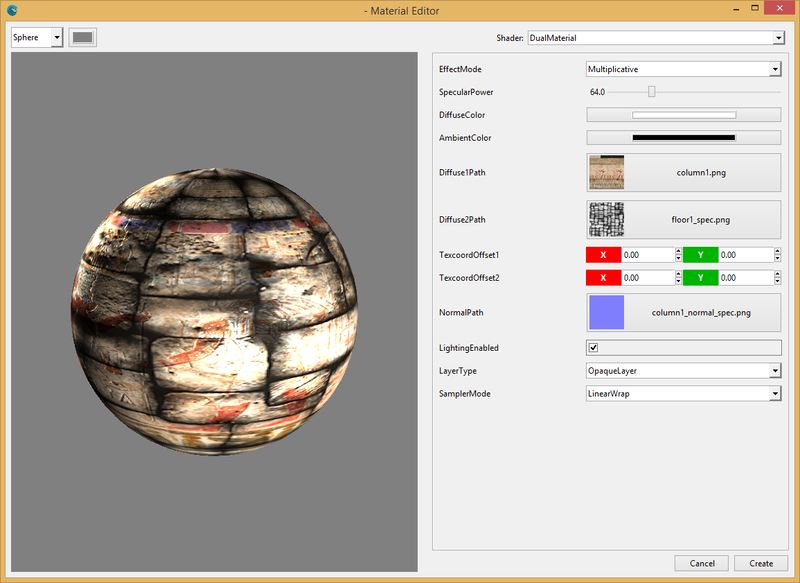 Normal: Changes the surface to a normal texture level. Gives the model the appearance to have more detail than it really has. 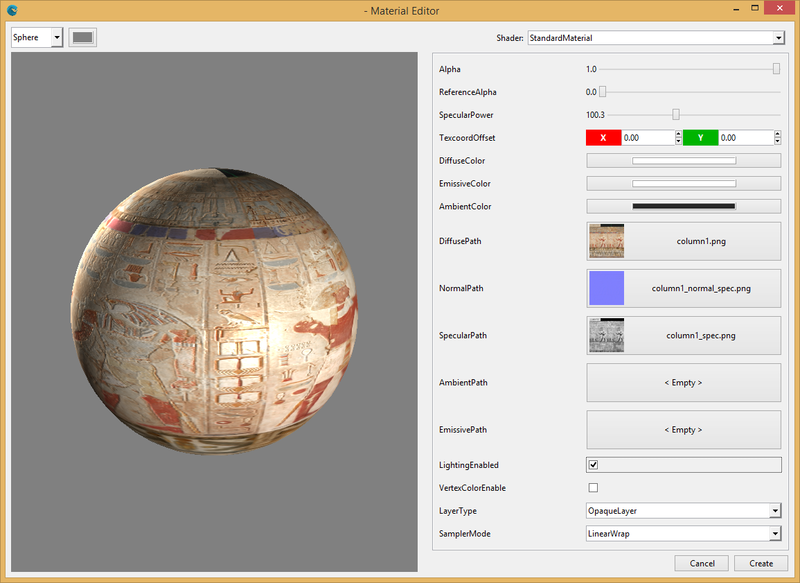 Ambient (IBL): A cubemap texture specifies the general illumination. Emissive: Controls which parts of the material will appear to glow. With the DualTexture Material, you can set two Diffuse textures at the same time, allowing to control how that textures will be blended. Each texture uses a separate UVW channel, so you can afford several common techniques like LightingMap (specify the light/shadows of the scene using a texture). Additive: Sets the additive blend. Adds the second image onto the first image. Mask: Applies an alpha blend of the second image onto the first. The Environment Material is useful to create reflective surfaces. 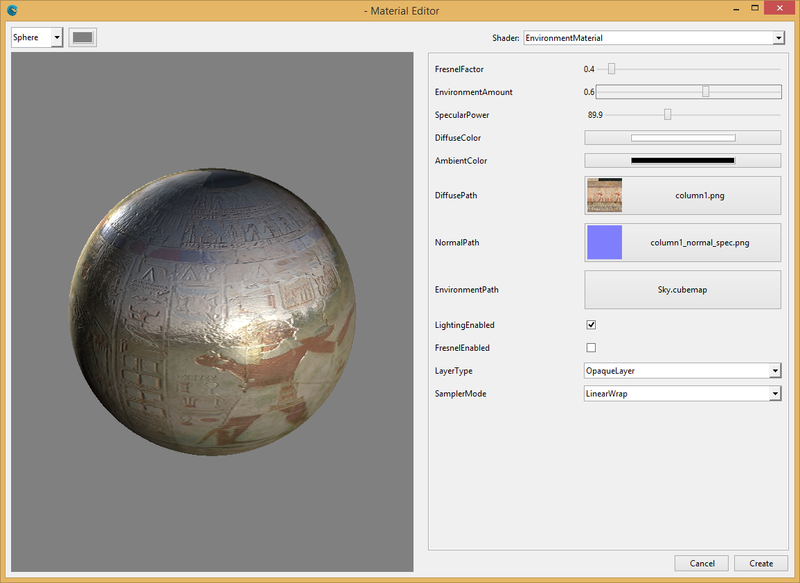 The key feature is the usage of a cubemap texture to specify the model reflection. Additionally, you can change the Diffuse and Normal material appearance, and control how the reflection affects the model. Now you can create your own materials that will be affected by light. We have created a Material subclass called DeferredMaterial that allows programmers to control how each Render Passes of the Light Pre Pass technique that will be rendered. We will continue revealing more WaveEngine 2.0 features during the next few days. Stay tuned at @waveengineteam and waveengine.net.